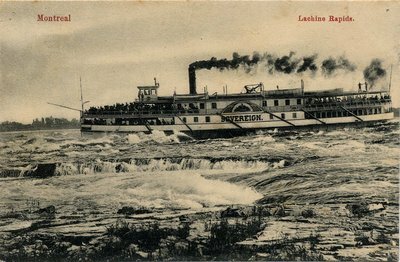 One of the rivals to the Richelieu and Ontario Navigation Company in running down the Lachine Rapids, was the Ottawa Navigation Company, whose operations stretched up the Ottawa River. Here is a dramatic image of the SOVEREIGN in the Lachine Rapids. 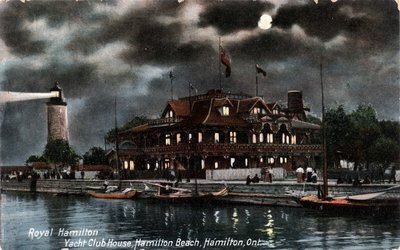 Moonlight cruises were a popular recreational "adventure" at the dawn of the twentieth-century. 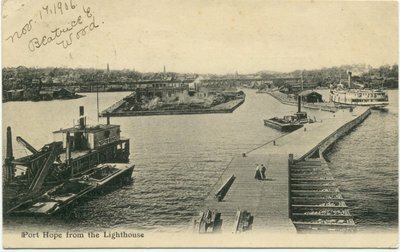 Postcards were frequently tinted to comemorate the experience. Dramatic clouds would partially cover a full moon (which appeared at every angle of the compass). This image is purest fiction. 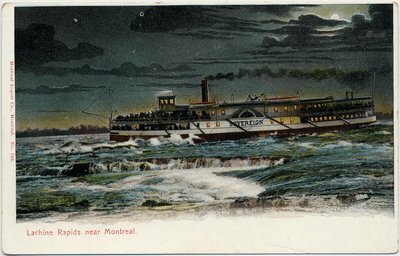 No steamboat ever deliberately ran the Lachine Rapids after dark. No one in their right mind would have taken the trip, and no insurance policy would have covered it. A rather unglamourous image of a dredge and scows working at the mouth of the Ganaraska River in Port Hope harbour. A scattered few folk wander the wooden pier. 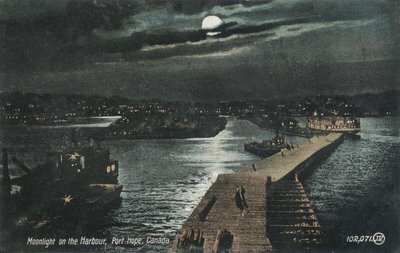 How much more romantic (and saleable) as "Moonlight on the Harbour" with the warm glow of the lights from the visiting R & O steamer competing with the full moon on the northern horison. 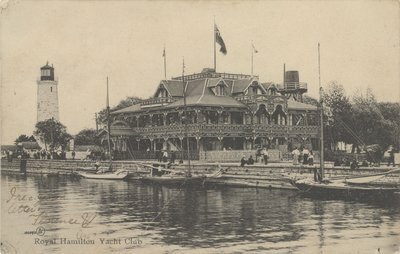 A busy day at the Royal Hamilton Yacht Club alongside the Burlington Bay Canal. A variety of craft show off the Club's fleet. The image is much more powerful as a night view, with the powerful lighthouse beacon shining out, and the windows providing a warm welcoming glow.